Ok, almost finished. I still have to finish stitching down the binding but CLOSE ENOUGH! I started working on this bad boy a hot while ago, but you know how things go - - - you move a few times, you start quilting it only to hate the quilting and pick it all out, you turn the whole thing over to your mom to long arm, and then next thing you know, it's 18 months later. Whatever, I love, love, love this quilt, so it was all worth it!!! I think this is my favorite block, but I reserve the right to change my mind tomorrow. 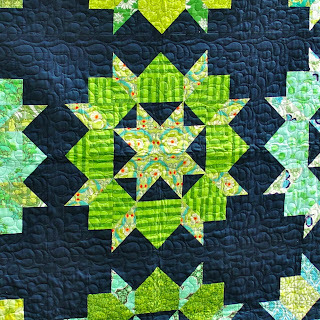 This quilt was made with the Swoon pattern by Camille Roskelley, and it's a fabulous pattern - clear instructions, accurate materials lists—the whole 9 yards (no pun intended). It's entirely made of squares, rectangles, flying geese units and half square triangles. I made mine with a navy blue Kona background, and then a bunch of different greens from my stash. My fabulous, wonderful, extremely talented mother longarmed this gi-normo quilt for me. Let me not understate how awesome my mom is, people. Not only did she long arm this sucker, she also ripped out the really bad long arming I did on the top quarter of the quilt when I decided I hated it and should probably just use the whole quilt for kindling at a fall bonfire. I'm a lucky girl. Didn't she do a lovely job? 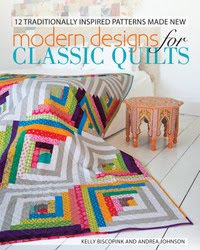 I LOVE the quilting - - hopefully you can see it. It's this really swirly kind of loop. Delicious. I hope you're having a lovely day sewing!